Cable protection and pass-through - Smooth plastic fingers provide proper bend radius. 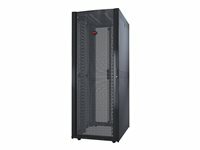 High density cable management - The vertical mounting rails are opened up for increased cable access and the roof design has large open areas for cable entry/exit from the enclosure. Improved cable access - Maintain and organize large cable bundles for improved efficiency with open vertical mounting rails and large cable openings in roof. Integrated high density cable management - Decrease installation time while supporting the cabling needs of large networking switches. 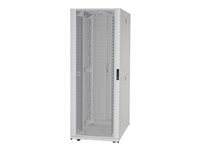 Optimized enclosure design for side-to-side airflow - Airflow management panels, left vertical mounting rail, and side airflow duct kit ensure proper side-to-side airflow to the networking switches from the cold aisle and provide isolation of hot air preventing it from re-entering the cold aisle. Additionally, the front left vertical mounting rail acts as an air block for exhaust air from networking switches.